What is your secret? Do not say you have none, because you do. We all do. Sometimes our secrets liberate us internally, but sometimes they enable us: They enable us to live unconsciously in our deepest thoughts. Sometimes we tell, and sometimes we do not. That's the thing though, what is it that helps us decide when to remain silent or when to talk? That is what They Never Told is about. Monica engages the reader by introducing you to the journey of four (4) adults who are survivors of childhood sexual assault. Each person tells a story spanning from childhood to present that introduces you to their world. To a world that others can relate to as their own. To a world that is sometimes up, sometimes down, and oftentimes reflective. To a world that contains potential answers for our future. 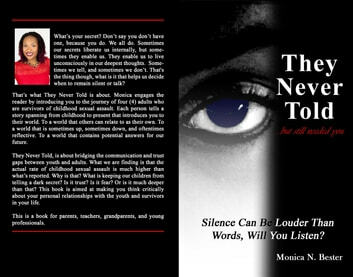 They Never Told, is about bridging the communication and trust gaps between youth and adults. What we are finding is that the actual rate of childhood sexual assault is much higher than what s reported. Why is that? What is keeping our children from telling a dark secret? Is it trust? Is it fear? Or is it much deeper than that? This book is aimed at making you think critically about your personal relationships with the youth and survivors in your life. This is a book for parents, teachers, grandparents, and young professionals.